Until recently, StatCrunch was a stateless system, meaning that users had to start with a blank slate each time they opened a data set to analyze it. There were no procedures in place that allowed users to save their work other than exporting analysis results individually in static formats. Recent StatCrunch updates have changed all that. StatCrunch users can now save their data as well as their analysis results and settings that make up a StatCrunch session and then reopen this session information later to pick up where they left off. Additionally, StatCrunch session files can be downloaded and shared with other users so that work done in StatCrunch can be communicated in a live interactive format. The term "results" refers to the graphical and tabular output produced in separate windows when analyzing a data set with StatCrunch. A complete listing of all results generated in a session is available under the StatCrunch > Results menu. This menu also contains convenience methods for showing, hiding and deleting results. Note that clicking on the x icon in the upper right hand corner of a result window does not delete a result from the session, but rather this action simply hides the result from view. The number of hidden results is displayed in an orange notification bubble on top of the StatCrunch menu itself. A result can deleted from a session by using the Options > Delete menu option on the corresponding result window. When results are saved in a session, these results will be regenerated and repositioned to their previous screen location the next time the user opens the data set or the associated session file. If a user is working with interactive StatCrunch applets as part of a session, these applets will be returned to their saved state when the session is reloaded. For example, if StatCrunch has been used to simulate flipping a coin 30 times (Applets > Experiment > Flip coin), the same results for the 30 tosses will be generated when the session is reloaded. In addition to results, all settings such as fonts, color schemes, orderings etc. will also be saved as part of a session and then reset when the session information is loaded back into StatCrunch. A complete expression history will be saved and restored as part of a session if any expressions were used. Saving session information at statcrunch.com is very easy to do. 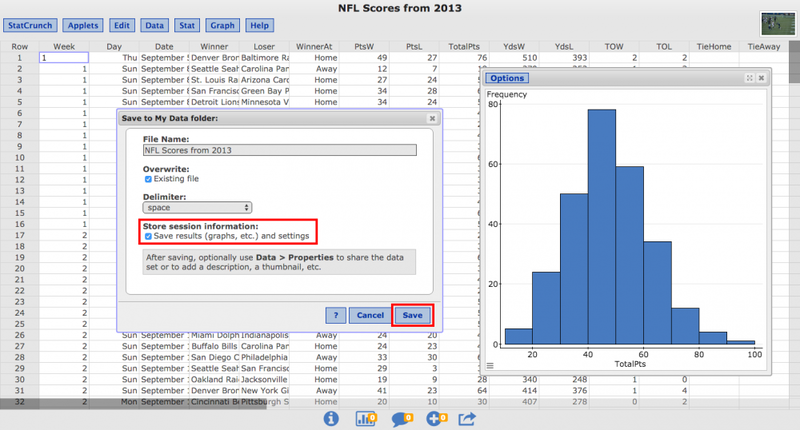 After opening a data set and analyzing it with StatCrunch, simply select the Data > Save menu option. In the resulting dialog window, turn on the Save results (graphs, etc.) and settings option under the Store session information heading, and then click Save as shown below. The data along with any analysis results will be saved to the statcrunch.com server under the user's My Data listing, and the results will be regenerated and repositioned the next time the user opens the data set. In addition, all settings such as fonts, color schemes, orderings etc. will also be saved with the session information. A complete expression history will be saved as part of the session if any expressions were used when working with the data. If the data set is shared at statcrunch.com, then only the data without the session information is currently made available to other users. 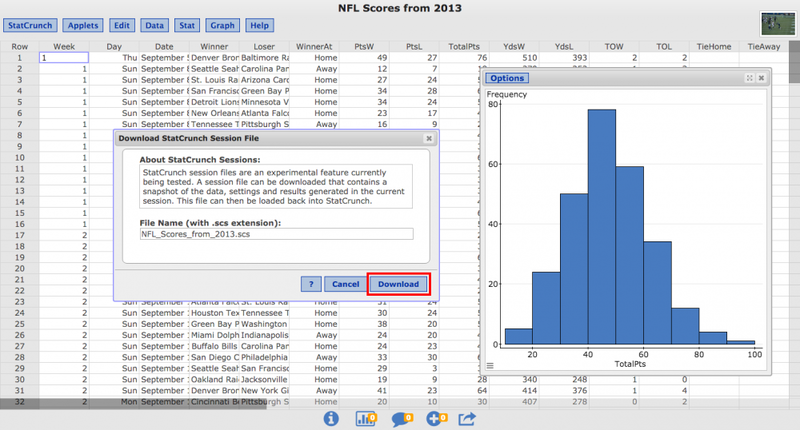 Beginning in early 2016, StatCrunch users will have the option to include their complete session information when they share a data set at statcrunch.com. In the interim, users can download and share StatCrunch session files with other users individually. 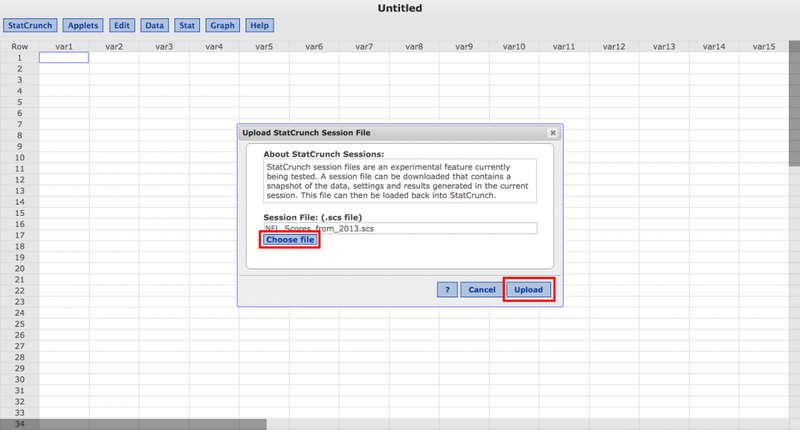 After performing a data analysis with StatCrunch, simply select the StatCrunch > Session > Download menu option. Click the Download option in the resulting dialog window as shown below. The name of the file that will be downloaded is also shown in the dialog window. StatCrunch session files end with a .scs extension. These files contain a complete snapshot of the entire StatCrunch session including data, settings and analysis results. These files may be useful to students who wish to upload them to turn in data analysis assignments within course management systems like MyStatLab and Moodle. StatCrunch session files can also be shared with other users via email or using cloud based systems like Google Drive or Dropbox. A StatCrunch session file can be loaded back into StatCrunch in several different ways. One can upload a scs file to statcrunch.com in the same manner as data files in other formats such as csv and xlsx. To use this approach, click on the My StatCrunch link after signing in at statcrunch.com. Next, click on the Select a file on my computer option under the My Data heading. Choose the desired scs file and upload it to statcrunch.com by clicking on the Load File button. The associated data and session information will then be stored under the user's My Data listing at statcrunch.com. A session file can also be loaded into the software directly by dragging and dropping it into the data table or by uploading the file using the menu options within the StatCrunch application. Using either of these approaches will erase any existing data and analysis results and replace them with the information from the session. These approaches also do not result in the session being saved to statcrunch.com unless the user explicitly does so using the Data > Save menu option. To load a session file within the StatCrunch application, sign in to statcrunch.com and launch the application by clicking on the Open StatCrunch link at the top of any statcrunch.com page. When the application loads in a new browser tab, select the StatCrunch > Session > Upload menu option. Choose the desired scs file and then click the Upload button as shown below to load the session information into StatCrunch.